The Labor of Happiness: A Thread at Yale Reflection. “I was happy then.” That kind of thing. We know now what our parents and grandparents may not have: “X makes me happy” isn’t the healthiest requirement of a person, place, or experience. “I can be happy with X” is. But old social demands die hard. And no one wants to bear the burdens of their own angst and anguish alone. No one thinks happiness (or contentment) should require much work. It’s more comforting to believe that the external can be blamed when we are unhappy and some un-bottle-able kismet is responsible when we are happy. That absolves us. I discovered at Yale earlier this week, that happiness isn’t just work for me. It’s hard labor. But I also learned that I’m fit for the rigors of it. 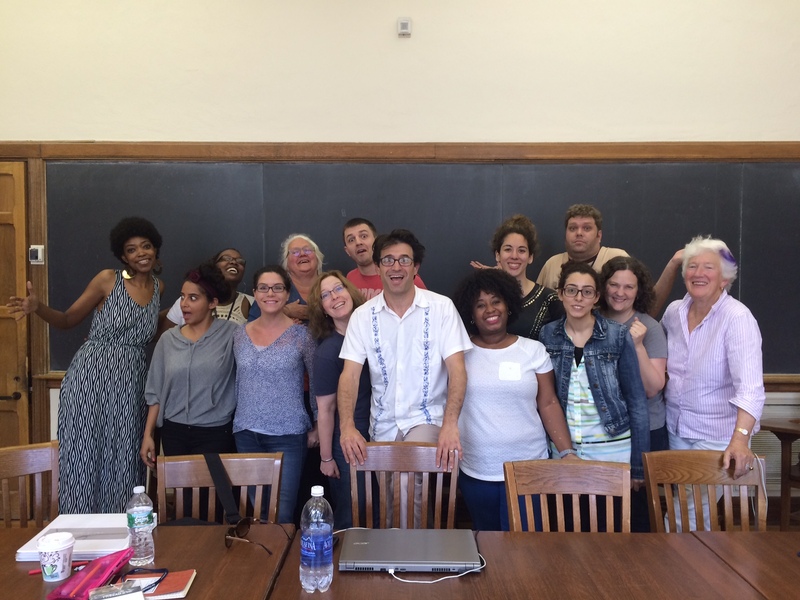 I needed Thread at Yale, the 3-day, 3-night conference on multimedia storytelling I attended June 7-10, to be transformative for private reasons. (I’m pretty forthcoming here about my personal and professional challenges, so those reasons may not be difficult to guess.) But I also needed to enjoy it. The use of “needed” is deliberate here; this wasn’t a wan desire. Enjoyment wasn’t optional. I needed to leave New Haven feeling like I’d wrung its most pristine higher ed institution dry. I’ve no idea if I’ll ever get to return. And I needed to feel stretched and twisted and pulled taut, too; happiness lasts longer when your muscles ache at its memory. But the happiness, the enjoyment, those weren’t things I needed for just for myself. I was thinking of the people who helped me get there. There were so many of them, some identified, some anonymous, none who I will ever be able to thank enough. I knew that the closest I could get to adequately expressing my gratitude would be to maximize the experience, to let every minute I spent there make the full ride through each cell and tendon and synapse. To do that, I had to introduce myself to more people than I would normally feel comfortable meeting in a day. I had to be an active listener and a keen observer. I had to participate fully in workshop, to spend lunches and dinners among new folks, to bond with the people I instinctively knew would become real friends. And I had to make it look easy. Because no one should ever be made to feel like paying attention to them is a laborious act. I look at this and I know. I was happy. I think we all were. We worked for it. Workshops were held Monday through Wednesday for three afternoon hours. We discussed 4-5 projects a day, offering feedback on stories told either in print, video, or audio formats. And we also just learned about how writers live. I’d assumed before showing up that I was drifting on an ice floe out here in Baltimore, floating further and further away from the epicenter of a successful writing life. But I realized most of us feel that way, no matter our money and privilege (or lack thereof), no matter our residential address, no matter our age. And most of us worry constantly about whether or not we’re on the right track as we struggle to balance ourselves on that floe and to keep creating, as all around us, professional leads and private loves go cold. That may sound depressing, but I found it so incredibly affirming. I don’t know. Maybe you had to be there. But I promised I’d try to take you with me. Especially those of you who helped me finance this trip. So here’s a multimedia story, told I spent most of yesterday creating. It’s at VoiceThread.com, a basic slideshow-with-audio capacity app I found by Googling. I flattened my inflections in the narration because I’m mimicking Gillian Laub, who showed us her own narrated slideshow, during her talk on our third night in town. I’m talking fast because I wanted to convey how time flew. And I’m also channeling my Ira Glass NPR voice (which is something we were frequently warned not to do. lol). Artistic director of The Moth, Catherine Burns, brought writer, Matthew Dicks, to tell us a Moth story in person. It was devastatingly beautiful, but I can’t find a recording online. She also showed us lots of clips. Chimamanda Ngozi Adichie is right. We all have to let go of our preoccupation with being liked by one and all, at some point. It’s not an attainable goal, and it’s the absolute wrong one to chase. Intuition and self-awareness are great time-savers. Both help you know right away how much time to invest in a conversation. You definitely want to check out fellow Thread attendee Naima Green‘s gorgeous photography website. Innovative digital storytelling involves a great deal of risk — and, like most other kinds of writing, good luck making money at it. Many of my self-confessions (“I’m not social,” “I don’t perform extroversion well,” “I never go out, now that I’m a mom,” and “I’m more passive than I’d like to be.”) are terribly outdated. Whatever your field is, it’s always going to be an enriching experience to regularly gather with others committed to that field. There are so many concerns and questions specific to our vocations and we forget that when we spend too much time away from others who’ve dedicated themselves to them. I discourage easily. This will come as no surprise to people who regularly read my work here. And I’m just coming to terms with the fact that all my days are marked with either a vague or an acute melancholia. I’ve always known that, but I’ve never been comfortable publicly, directly owning it. I can’t say that I’m depressive; I’ve never seen a therapist, never been diagnosed with anything. I do bear some of symptoms of depression, but I’m never quite incapacitated by these symptoms. They just sit with me, like familiars. And I function. Sometimes, in fact, they help me function, as it relates to writing. I try not to talk about this too often, for two reasons. The first is that, when I’m sad or suffering from a fairly intense crisis of confidence or a bout of ongoing disappointments or genuine panic about the possibility that things may not actually work out in the end, people tend to think I’m fishing for affirmation and reassurance. I can assure you I’m not above fishing for affirmation — words of affirmation are my love language — but if I’m expressing an insecurity here at my blog or even on social media somewhere, I’m not trying to make others feel obligated to cheerlead for me. In truth, I have enough wonderful friends and family who do that without any prompting. They’re exceedingly patient about it and they never scold me for ingratitude or seem put-upon for their efforts. They’re just good to me, for whatever reasons, and I’m more grateful for them than I can say — even when I’m too down to see the goodness aligning all around me. There was an emphasis on renouncing negativity — and sometimes, the labeling of things as “negative” — like certain moods, emotions, or creative expressions — felt untenable to me. “Don’t claim that” and “don’t confess that” were oft-repeated admonitions, especially during adolescence. So, in conversation, I learned not to express sadness. Or insecurity. Or jealousy. Or malaise. Or discouragement. Or feelings of inadequacy. Or fear that I wouldn’t find someone I loved enough to marry. Or fear of marriage, period. Fear of attracting (and re-attracting again and again) a certain kind of man, a certain kind of career outcome, a certain kind of fate. Those currents continue to pulse under my skin. Sometimes, they still show on my face. But I manage them by writing. Putting my “negative” experiences on paper comes with its own chastisement, but I’m better able to handle that than someone coming up to me and accusing me of not trusting God. I am talented and I work hard at writing — or at least I work consistently at it. I read a lot. I try to develop informed opinions and challenge myself to articulate them well. And I also just want to move people. Especially the melancholy people. And even more specifically, the people who have internalized opinions of themselves that are hypercritical, unflattering, or ugly. I write for the self-conscious and for the people who cry over words, both good and bad ones. I write for those who feel compelled to hide — and for those who take tentative steps into spotlights. I write for the people who shrink at center stage, because they aren’t sure how they got there or if they want to stay. And I don’t know. It’s hard to find homes for that writing sometimes. Welcoming homes, homes that pay, homes that don’t discourage lyricism or honesty. But I can also attest that, when you write — even when you feel most transient — so, so many outlets will open their doors. You will entrust something of yourself to them, and in turn, they will entrust something of themselves to you. And it will be okay that none of these spaces become permanent homes. You are not always down and out, when you are discouraged. You are not inadequate when you aren’t working where you want, at the pace you want. And your real feelings are more useful to others than any you may feign for those who are uncomfortable with candor. You aren’t “making a liar out of God” by being honest with yourself. For me, at least, “confessing” my actual, fraught, deficient, uncertain, doubting, terrified thoughts before God and man are an expression of how much I trust God not to condemn or abandon me. Honesty about how often I sit with sadness or how close discouragement often feels, that is the true measure of my faith. In many ways, I think it also accounts for the opportunities I’m afforded. They are many. I am at once overcome and relieved and intimidated by them. I’ve no need to apologize for that. My joy has never been invalidated by my sadness. 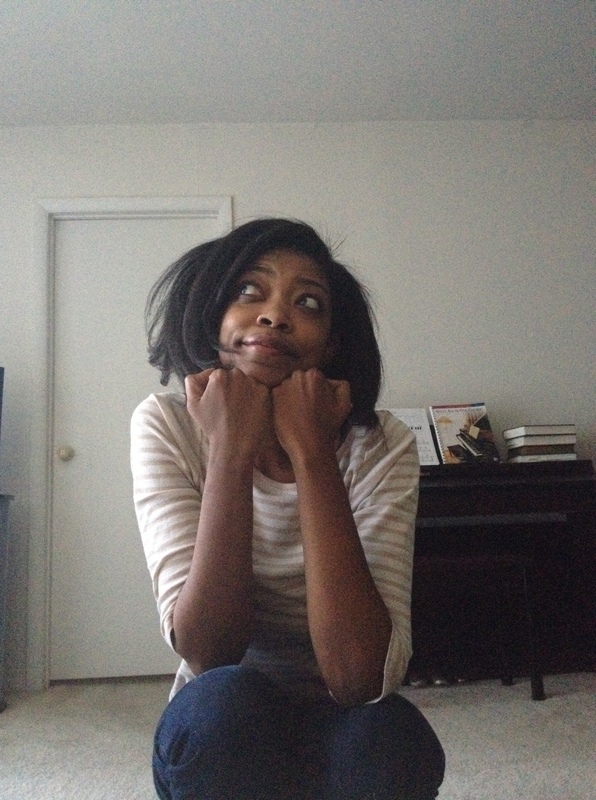 Starting next week, I’ll be writing for my friend Alyssa’s blog, Act Four, at The Washington Post. I’ve guest-blogged there before. Though I’ve blogged about both of those experiences, here’s something I didn’t share: the first time Alyssa invited me, she said that maybe it would turn into something more frequent. As is usually the case when I hear that, I didn’t hold the maybe in my palm. I didn’t turn it over or envision it or name-it-and-claim-it. I simply thought: if it will be, it will be. I put both the bridge and the crossing of it out of mind, until… well, now. May my measure of faith and my melancholic heart carry me over. My Writing Process: Living Better. Oh, man. I really forgot I was supposed to do this by today. Nicole D. Collier graciously, generously, thoughtfully asked me to participate in the blog tour almost two weeks ago, and had I not seen my good friend Joshunda’s insightful response this morning, I would’ve likely gone on forgetting. Nicole is a really lovely writer and a singularly insightful thinker. She writes about things I wouldn’t readily consider. And sometimes when I’m reading Joshunda, I feel like she’s been reading my mind. I’m honored to be in their writerly company. Apologies, y’all. I’ll try to be both brief and interesting. Becoming a better, more experienced, more observant, more interesting person. I’m 34 and inward to a real fault. I think my writing tends to suffer because of it. Social media, where I’m very active both for work and leisure, hasn’t always helped; my networks give me more reason to tune out of the world around me and to neglect the very necessary craft-observation of the people I encounter. I’m earbuds-in, head-down a lot of the time and I’m working most on being less invested in what’s going on in the palm of my hand and more invested in what lies without. Writing people and places and experiences is only as authentic or credible as your witness. Imagination relies on what we can already access; no matter how little the worlds you build in your work resemble the one where we live, those worlds will be populated with ideas and people and experiences that draw on what you’ve seen and done and survived. Sometimes I feel like I’ve exhausted all my observation/experience and need to go out and acquire more… life. But every day is rife with potential, if you’re paying attention. I’m really working on that. Like a ton of writers/artists have already said: I don’t know that it does. I try to infuse a bit of the voice I use here at my blog — which is poetic and purple, at times — in the film, TV, culture commentary I write. These days, I feel like a lot of people are leaning more on a distinct personal creative nonfiction voice for commentary. It breaks up the “think-piece” monotony. It’s all I’ve got. For whatever reason, I can’t access fiction, despite the fact that my MFA is in fiction writing. It’s just not something I can do quickly or well. It’s one of the most mysterious, elusive genres in which I’ve tried to write, second only to playwriting in my difficulty with it. So I write what I can do fast and fairly well because I have a toddler and I’m her primary caregiver — which is to say I no longer have the luxury of struggling for months and years with no finished product to show for it. I can turn around an essay in four hours or less a lot of the time. It’s far more gratifying. These days I just write when, where and what I can. If it requires research, I open Google and do a cursory search. I go down the rabbit hole of long and short-form reporting both on the issue at hand and any tertiary issues that should also be considered. In the reading, I wait for the angle to become clear to me. It usually does after I’ve read between 4-6 strong, investigative pieces. For blog entries, which I consider to be short personal essays that usually don’t require reporting, I just try to find quiet space to reflect or recollect details. Voice is very important to me here so silence, if I can swing it, is pretty important, as I need to hear the voice I’ll be using. I read aloud for flow (or try to) before hitting send or publish. If I don’t like the flow, I reword until I do. Up until about a year ago, I was composing almost entirely on my iPhone and pen/paper. I have a particular brand of pen I prefer to use and I favor spiral notebooks. Now I have a Chromebook, and I’m using that to type this. But I still find that my iPhone-writing habit is a bit hard to break. It’s with me everywhere; this Chromebook isn’t. I’ve asked my good friends Syreeta McFadden and Terryn aka DopeReads to do this next, but since I’m so late asking, I can’t guarantee it’ll be them. If it is, though, expect their installments on June 11.